Johnson State College Educational Technology: What rules? Mail rules. Let's face it, rules don't elicit warm fuzzy feelings, BUT here's how you can use eMail Rules to make life a little easier & more productive! #1 - You're getting tons of eMail @jsc.edu and you want to eliminate some of it. #2 - You love your Gmail -insert your fav email service here- but no so much your Outlook; how can you get all mail into one location? #3 - You really want your Moodle class activity forwarded to your phone. 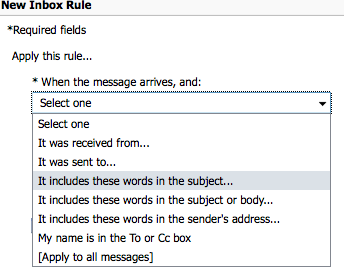 #4 - Even better, you really want your Moodle class activity to text you! 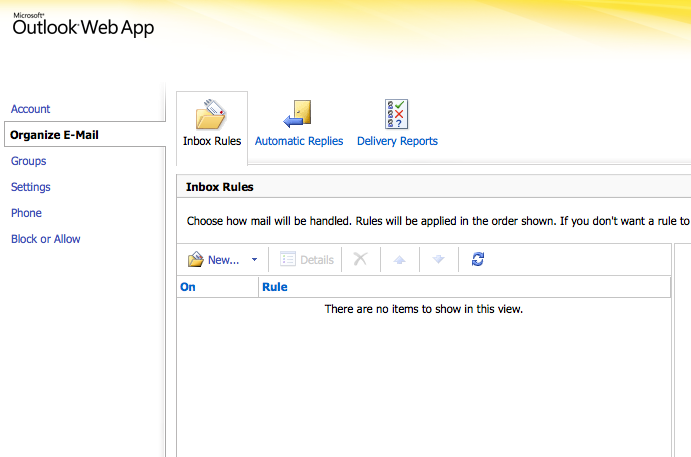 -On the right side of the page you'll see "Options"
At New Inbox Rule select from the dropdown When message arrives "It includes these words in the subject..."
After closing this popup window you need to choose an action like "Redirect the message to..."
If you Rule looks similar to this, then it's good to save and it'll get applied automatically. Any messages you receive with "EDU-1109-J01" in the subject will go to your Gmail!